If you could ban one outfit for a year, what would it be? Fashion is fun, whimsical, practical, or if you're at my house, wrinkled and likely some form of a pull-over or quarter-zip. I get it. I'm not here to be too judgey. But, let's just play a little mind experiment here. If, by some quirk of the laws of the universe, you could erase from existence just one outfit for a year, what current couture catastrophe would you choose? I'll go first and I'm going to be bold. Men, listen, this is for our own good. 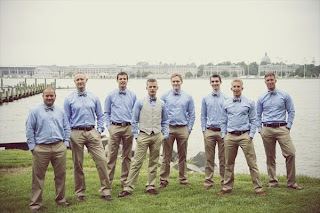 I'm banning the classic khaki pant/blue oxford combo. Stop! Wait, what? Am I serious?! Yes, as serious as a heart attack. I know this outfit is versatile. I know it's the casual dressy look that you've been sporting since your fraternity days (or earlier). But you're all caught in a rut. This outfit, despite what you've told yourself or been told by weak-willed others, is not the height of fashion. It's not even the sidewalk of fashion. It's easy. And it's bland. And you can do better. 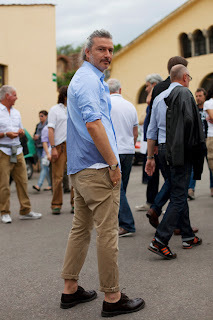 Tucked in, untucked, freshly pressed or ravaged by wrinkles, the khakis and blues look has haunted and limited us all long enough. So, I propose a one year moratorium. You don't have to throw out all your Dockers and Polo oxfords, but you can't wear them together--for one whole year. Explore color. You see guys wearing blue, green, and rust-colored pants. They look. . . different. At first. But, eventually, you become accustomed and they look normal. Don't be scared. Try a pair on. And prints. You could try a nice textured shirt. Or a polo. Or a half-zip. Or a jacket! I'm even willing to let you wear a white shirt with a cute tie. And khakis if you must. So, get in your closet, try out some funky combinations, get your girl/boyfriend to take you to Ben Sherman or some other section of the mall that isn't afraid of colors and textures and GO WILD. I can't wait to hear what you want to ban now. Do I hear hoodies, anyone? GregM, I know I'm guilty of this sin. I'll do better. A little off the subject but why do guys, younger ones, what to shove their hands, yes both, into their pockets all the time. It can ruin the look of a well cut suit. I was in the military and this was a no-no. Some even had their pockets sewn shut.